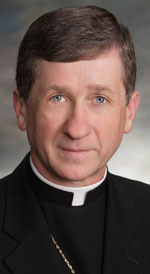 Domestic Apologist: Bishop Cupich's office releases a statement. During his first visit with the Respect Life Committee of the Diocese of Spokane Bishop Cupich expressed his gratitude for the commitment of the members. He also shared with them his plan to place emphasis on education. Surveys show that Catholics by and large mirror the general population when it comes to attitudes and decisions made about life issues. The present political environment has become very toxic and polarizing, to the point that people have become fixed in their positions, especially in regard to abortion, and are unwilling to talk to each other. The pastoral challenge is to get people to take a second look at the issue of abortion. It was on the occasion of his visit with the committee that the prospect of having the 40 Days for Life operate in the Diocese of Spokane this year arose. He expressed admiration for the many lay men and women dedicated to keeping the protection of the unborn a priority in society. While the 40 Days for Life program is not a Catholic initiative nor endorsed by the United States Conference of Catholic Bishops, he concluded that participation in it and in vigils by individuals or associations of Catholics was possible. At the same time, he indicated that he would not consider it under the umbrella of the respect life efforts of the Diocese. The Catholic Church is concerned about a broad range of respect life issues and has a pastoral tradition which shapes its approach. It is critical that we rely on programs initiated by the Church, lest our concerns and our pastoral approach be defined too narrowly. The committee expressed support for this approach and their eagerness to work with the Bishop towards the goals he outlined. When visiting with the presbyterate, the Bishop asked the priests to approach respect life issues as teachers, for that is what they are. Teachers create new openings for learning and reduce obstacles. Their intense passion to share the truth leads them to greater patience and prudence and not frustration with and disdain for students who fail to respond appropriately. Their witness to the faith through teaching becomes all the more powerful when the presbyterate works together in unity and solidarity. When the three diocesan bishops, all of whom are new to their dioceses in Washington State, met to review policies of the WSCC, they were asked if they wanted to reaffirm the policy of limiting distribution of respect life and other materials dealing with social policy issues to those published “by the diocesan bishop, the Washington State Catholic Conference (WSCC) and the United States Conference of Catholic Bishops USCCB.” This policy has been in force for at least 20 years. The bishops decided to continue this policy. The Bishop only asked that all priests prayerfully reflect on what he has told them, commit themselves to making teaching effectively their first priority and keep in mind the irreplaceable power of the witness of their unity with each other. This runs contrary to what many other diocesan priests confirmed, prior to this statement being released. Also, word of a "policy of limiting distribution of respect life and other materials ... to those published" exclusively by American bishops--and its apparent 20-year reign--comes as news to me. More digging on that to come.